No one has seen Phrastus the Scholar since his ill-advised return to the Imperial City. He's probably fine—he must be!—but in the meantime, his walled town house in Elinhir is available on an indefinite basis. 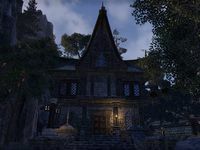 Domus Phrasticus is a medium player house in eastern Craglorn. Entering the house takes the player to a terraced courtyard with a modest-sized house. The house consists of two levels with an enclosed staircase leading to the second floor. Behind the house is a small stable. The name of the building, confirmed by the loadtext, indicates that the house actually belongs to Phrastus of Elinhir. As the loadtext implies, Phrastus himself is found inside the Imperial Sewers, standing in your Alliance Base, for those who have the Imperial City DLC. Contrary to the insinuations of the loadtext, Phrastrus is alive and well. This page was last modified on 25 November 2018, at 10:20.